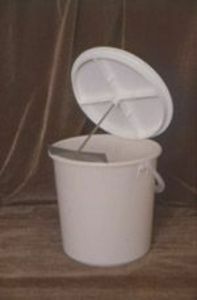 A cutter and lid, requires bucket, for use with a drill. The Pulpmaster is a simple but effective fruit-crushing tool, which is used in conjunction with an electric drill. The Pulpmaster consists of a stainless steel cutting blade with spindle, a plastic bucket cover with centre bearing and a two gallon (9 litre) bucket. About six pounds of halved or quartered apples are placed in the bucket and crushed by the rotating blade powered by the drill.